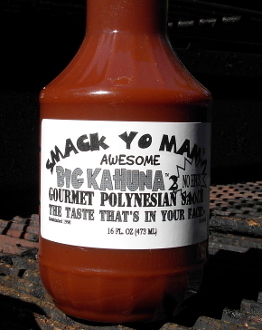 A Polynesian sauce containing pineapple and cream of coconut. This is the sweetest of our sauces. This can be used as a marinade or a mixer in your stir-fry. Ingredients: Tomato concentrate (sugar, vinegar, salt, natural flavors, potassium chloride, onion powder, citric acid, garlic powder, spices), Brown Sugar (sugar, molasses), Pineapple Juice, Pineapple, Cream of Coconut (sugar, coconut meat juice, polysorbate 60 (emulsifier), salt, sorbitan monostearate (emulsifier), sodium alginate and xanthan gum (stabilizers), citric acid, mono and diglycerides (emulsifiers), carrageenan (stabilizer), Water, Cider Vinegar, Liquid Smoke (water, natural hickory smoke flavoring), Onions, Coffee, Garlic Powder, Potassium Sorbate and Xanthan Gum for freshness.